Trying to stop texting while driving? If so, you are doing the right thing. 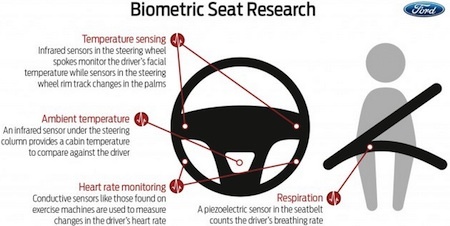 Ford Motor Company is trying to be helpful with their Biometric Seat Research. The biometric steering wheel and spokes have metal sensors that measure heart rate; they work the same as heart rate sensors on gym treadmills and stair-climbers. An infrared sensor in the wheel measures the temperature from the driver’s hands and face. A downward-facing sensor under the steering column measures cabin temperature for comparison to the driver’s temperature. A piezoelectric sensor in the seat belt measures breathing rate.